Main Attractions: Bird watching, open fields, scenic trails, woodlands. 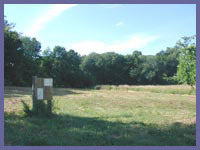 Gurski Farm - Williams Park in Brookfield, CT. are two separate land preservation projects that are joined by hiking trails that sprawl out into the woodlands where their boundaries meet. They can be hiked separately or together for longer hikes. In total they make up about 200 acres of open space that is frequented by hikers, cross country skiers, and joggers (most notably, the Brookfield High School cross-country team). Gurski is mostly open space with beautiful fields that lead up to a ridge, revealing a real nice scene of the southern valley. Williams Park is used for family recreation (tennis, picnics, playground) but also has a nice easy trail system leading into the woods. Gurski Farm was an old dairy farm run by Eva Gurski and was purchased by concerned residents and community groups back in 1968 who were concerned that such a unique place would be developed once it was sold. Gurski an easy hike with large open fields as the main attraction. Though located right off a main road and surrounded by private property, it's amazingly quiet and tranquil here. 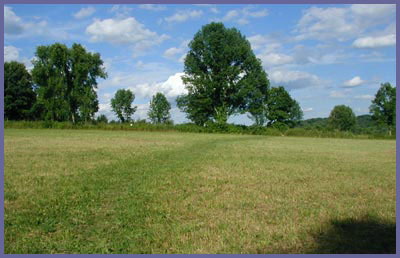 The field is bordered by small forest growth, which gives it a hideaway feeling. Gurski's Farm is a perfect place for relaxing and taking an easy stroll, or you might just sit down in the field and gaze at a deep blue sky. There are wild flowers, grasses, and vegetation to look at along with an abundance of wildlife. Birds, rabbits, wild turkeys, hawks, owls, deer, and fox are just a few of the wild creatures you'll might come across. (A dawn or dusk hike will undoubtedly yield interesting encounters with the wild animals; which may include seeing a fox quietly hunting in the middle of the field.) At the top of the hill there is a patch of woods. Here there are clearly marked paths that eventually lead to the athletic fields of Brookfield High School. Although it's tempting to wander off into the middle of the field at Gurski, try to remember to stay close to clearly marked paths. Birds nest in these fields, and it's easy to step on a nest with eggs without even realizing it. (If you just can't help yourself and have to walk to the middle of the field, watch your steps carefully in order to avoid harming the animals or their habitat.) All in all, Gurski is a good place to check out, and it is peaceful nearly all the time. Because of its relative proximity to Brookfield H.S., you may encounter the cross country team or distance runners who have made their way over to the farm. Williams Park is a small plot of land set aside for recreational use. It's directly across the street from the Brookfield Library off Route 25 about a mile north of Brookfield Center and the intersections of Rt 25 and 133. The entrance is marked by a small stone veteran's memorial and American flag. There are some tennis courts, a playground, and picnic tables for those who want to relax and enjoy a peaceful rest from the hustle and bustle. The local Boy Scout troop also has done a lot of work to restore and add-on to existing trails that branch out into the woods. If you want a peaceful walk through the woods, you can't go wrong here. The Boy Scouts have made the trails clean and easily marked. They have also placed tib bits of information along the way so you can learn more about the natural environment you find yourself in. From Interstate 84, take exit 7 (Brookfield/New Milford exit). You're now on Rt. 7 extension which bypasses Brookfield's commerce area and hooks back up with Rt. 7 a few miles later. Follow Rt. 7 Extension until it ends in about 4-5 miles. Take a left. You're now back on Rt. 7, or Federal Road. as it's know locally. About a quarter mile later, you'll want to go left onto Silvermine Rd. A half mile onto Silvermine you'll come to a four stop sign intersection. Just go straight through, remaining on Silvermine Rd as it winds up to the center of Brookfield. At Brookfield Center with its old historical buildings, just keep going straight through the traffic light. You're now on Rt. 133. Go past St. Joseph's Church located on the right side and about four-tenths of a mile down the bottom of the hill, on the left side, is a dirt cut-out which is the entrance to Gurski's Farm. Read the posted sign to help you get started with your hike.